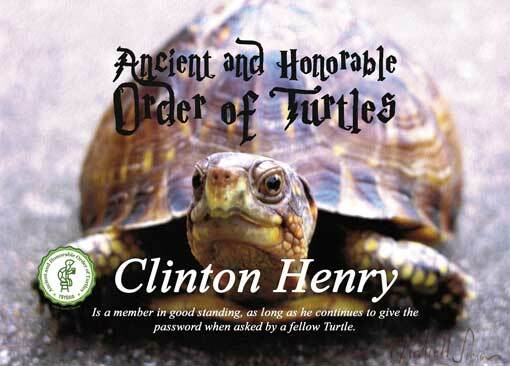 Born out of a chaotic period of time, the Ancient and Honorable Order of Turtles is a drinking fraternity full of laughter and fun. There are a few stewards of the rich history that we will reference. The organization can be as ordered and organized as you desire. Let’s get into the origin. Other groups claim an earlier origin, but documentation is lacking. My dad, Don Crabill, was initiated into the Ancient and Honorable Order of Turtles while in the US Air Force. He served in Korea during the 1950’s. The tradition spread from the military into general aviation where his career in avionics sales took him all over the world. Sometime in the 70’s, I was initiated. I’ve procured many a Turtle over the years and I’ve met some cool Turtles just by chance. On a date, with Sue, I asked her if she was a Turtle and not surprisingly, she gave the password! We were both a little surprised at the time and we were married about a year later – in 1984! Wow, time flies! Then some time about 2014 I ran into Chris Hamiltion from Old Newsboys of Flint. Chris is a big guy, can’t miss him. Former UM Football champ. Executive Director of Old Newsboys who helps thousands of kids at Christmas each year. Chris procures Turtles like no one I’ve ever met. He has out paced even Past Imperial status. I wanted to show Chris my old membership card from my dad and discovered that it was missing! The need for a replacement membership card. That is the inspiration for this site. You see I run a small marketing agency and designing and printing cards was right in my wheel house. So I bought a box of 1,000 folded cards and made them available and started meeting amazing people. The cards sold quicly, so I ordered more and added a few more items. We keep adding more as the ideas from our Pond come in. While I don’t claim any ownership or special status within the organization, I take pride in helping many procure more Turtles. Join the Turtle Club US Pond and help us bring more laughter into the world! Turtle drawn by my talented nephew, Ben Lew. As we work to procure more Turtles, we can do good for our community. Members earn commissions on purchases that can be shared with the charity of your choice. When you Join we set you up as a Member with a unique membership number.